On King's Bastion overlooking Spur Redoubt. TIME STILL ACTIVE IN THE SERVICE OF YOUTH. See the Royal Naval Museum information sheet on HMS Foudroyant and HMS Trincomalee and the HMS Trincomalee website. 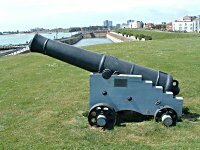 For details of many guns used on shore and at sea, principally during the 19C see the Palmerston Forts Society website.